We open at 9 and close all day. 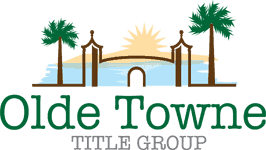 Olde Towne Title Group’s goal is to be the leading land title and real estate settlement service provider in the St. Augustine area and throughout the state of Florida by serving our customers in a friendly and professional way. With continuous resource development, technological innovation, teamwork, and communication, We aim to deliver unparalleled service and customer satisfaction with our teamwork, communication and training. We pride ourselves on our reliability, our strong values of integrity and professionalism. We hope you enjoy all of the resources and tools our website has to offer! We have invested in tools to help your success. You can now get instant net sheets in 30 seconds or less to share with your clients directly from our website or via our mobile app. Olde Towne Title Group is proud to say that we have the necessary experience to meet or exceed the compliance guidelines that are required of lenders. From day one they made everything easy and explained things thoroughly right till the end. Closed early and couldn’t be happier and highly recommend!!! Maureen and the staff here are top notch! Always quick to respond and really know there stuff. Our transaction was unconventional and more complicated than most. They never seemed bothered by my many questions and repeated phone calls. The actual closing went smooth with no issues and I attribute it to the team at Olde Town Title Group. I would not hesitate to recommend them to my friends and family. Maureen and Jessica have been awesome, made my house buying experience awesome. Olde Towne Title is a professional and friendly company to help you with your real estate needs! Rob McGee will go far and above to make you feel right at home!! Hours: We open at 9:00 and close all day.